On this page, we're going to look at the natural health choices you might consider if you want to change lifestyle habits in order to prevent and heal prostate problems. This is by no means a complete list. In fact, it's just a taster for what is about to come on my website and what you can find in my book, Healthy Prostate: The Extensive Guide to Heal and Prevent Prostate Problems. Another page to visit that gives much more specific advice on the prostate health diet, go here. If you ask people how well they eat, the answer from most is that they eat a healthy diet. Well, if this were actually true, then why do we have an epidemic of prostate diseases and such poor life quality as we age? Why are so many elderly people so unhealthy and reliant on drugs? Why has chronic disease and the loss of functional mobility become so rampant among the elderly? Why are we not vital until old age like the Okinawans of Japan who live and work to a very old age with none of the awful health problems of most of our elderly? A first step in making way for natural health choices is to stop eating too much poor-quality food. In general, North Americans eat far too much of it. And we pay a very high price for this cheap, yet devitalized food. The fast food craze is over! It's not a novelty any more. It's a killer. Of course this insight is not in the interest of the companies that produce these foods or the pharmaceutical industry that gives us medical concoctions that have devastating side effects to fix us good once we have a chronic health condition. We have bought into the "miracle" of fast and convenient, cheap food. We’ve also bought into the medical profession, which supposedly has the answers! We are to blame for playing our part by not being conscious and conscientious of what we are doing to our bodies. The only answers are stopping what's not good and make room for natural food choices. That's right! Get it out of your cupboard. Don't even buy it. Yes, it appears that the food we eat has no immediate effect. However, the cumulative result of poor food choices adds up over time and takes its toll. 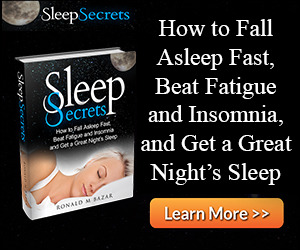 We cannot discharge all the toxins quickly enough and, as a result, we develop health problems as we age. It is clear what causes prostate diseases. It's also clear that natural health choices begin the healing process. 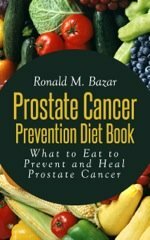 Prostate problems are rare in cultures that eat traditional, natural foods. 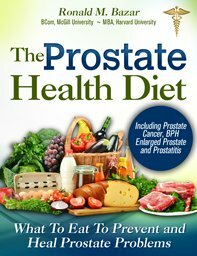 Men’s prostate health requires healthy, natural food choices. Poor prostate health results not from the fact that we live longer as the medical profession would have you believe, but from accumulating toxins from our modern devitalized non-food products (e.g., chips, commercial dairy and meat, and instant foods). Time and repetition of poor food choices takes its toll. Guaranteed. That's why we have an epidemic of prostate disease in the West. See more on ranking of food choices. Our day-to-day diets and habits determine our health condition. If a weak constitution is combined with weak health conditions created by our lack of natural health choices as we move onwards in life, then the body is ripe for many chronic diseases, often very serious ones. This is especially true for prostate diseases because of the accumulation of toxins in the prostate. Some people have a strong constitution and seem to never get sick. A man like this can abuse his body for decades with a poor diet and unhealthy lifestyle choices. This type of man, when he is in his 40s or 50s, may suffer a massive heart attack or sudden prostate cancer. His daily condition will finally overcome his powerful gifts of a strong constitution. Therefore, what we were given from our parents and what we do with it creates our health conditions, our disposition to disease in general and to prostate disease in particular. In the case of the prostate, men can inherit a weak constitution in that area of the body. This does not mean that men with a weak constitution are doomed to prostate diseases. It just means that these men are more susceptible than others and will have to make changes to maintain prostate health. My father had an enlarged prostate, or BPH, and I got that too, but much earlier in life than he did. For me, it was a combination of weaker constitution and a poor diet for many decades, some of the key causes of an enlarged prostate. By not making natural health choices, we face the slow accumulation of toxins and the slow deterioration of our health. Is the price tag worth it? We have become so disconnected from nature with our big city living that we have lost our connection and ability to relax and rejuvenate in nature. This is not the way for natural health. Many of us suffer from TVitis or gameitis or internetitis, we watch or play 6 hours a day or more and do not get any exercise. A simple tip: Add daily exercise to your life and your prostate will be happy. A big tip: By now I hope you are beginning to understand a bit about what causes prostate problems. Knowledge is power, and making better life choices can reverse our health problems. Just start where you can with what you can. Then add more natural health choices and lifestyle changes as you go along — choose to do it. 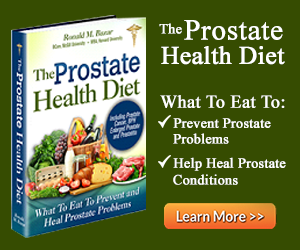 Regain your natural prostate health! To conclude, use your daily habits to create a stronger health condition and a healthy natural prostate. In time, good habits will affect your constitution and make you healthier. To learn more about what really, truly constitutes natural health choices, read more, much more in my book. We replace all our cells every seven years. You can rebuild your body over time at the cellular level to give you real health by the daily choices you make. Despite what you may have been lead to believe, you have control over your health.